UNITED NATIONS, Mar 8 2012 (IPS) - As the race towards gender equality moves at an exceedingly slow pace, the United Nations is calling for a major international conference on women in 2015 – 20 years after a landmark meeting in Beijing in 1995. The proposal, made jointly by Secretary-General Ban Ki moon and the President of the General Assembly Ambassador Nassir Abdulaziz Al- Nasser of Qatar, will go before the 193-member General Assembly for final approval. The U.N.’s highest policy-making body has been asked to take “the necessary steps” to formalise the logistics of the conference, during its current session which concludes mid-September. The announcement coincided with International Women’s Day which was being commemorated worldwide on Mar. 8. “Given that women make up half of humanity (out of a total population of over seven billion), and given the importance and relevance of women’s issues for global progress, it is high time that such a world conference is convened,” said the statement released Thursday. This will be the fifth major international conference focusing solely on women. The last one, the 1995 Fourth World Conference on Women in Beijing, adopted a Platform of Action which is still in the process of being implemented. The Beijing summit was preceded by three world conferences, beginning in 1975 in Mexico City, and followed by Copenhagen in 1980 and Nairobi in 1985. The proposed 2015 conference follows in the footsteps of the upcoming international conference on sustainable development, also called Rio Plus-20, scheduled to take place in June in Brazil: 20 years after the Earth Summit in Rio in June 1992. If the General Assembly approves the proposal, the meeting is likely to be informally dubbed Beijing Plus 20. “Women and girls hold tremendous potential and, we will continue championing their health and rights, especially their right to sexual and reproductive health,” he said. “We should also promote maternal health to save women’s lives. These efforts are critical to the well-being of present and future generations,” he added. Women’s unmet need for voluntary family planning should be fulfilled, so they can space their births, attend school, seek and keep jobs and contribute even more to their nations. 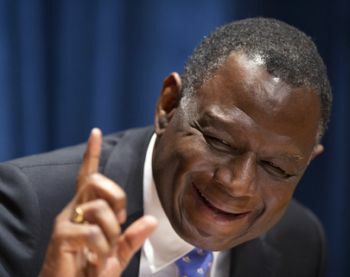 Empowered women can help eliminate poverty faster, Dr., Osotimehin said. “I hope that, with the prominence given by the secretary-general and the General Assembly president to women’s health and rights, these will remain central to any development agenda beyond 2015,” he said. Alisa Clarke, president of the Global Vision Institute (GVI), told IPS her organisation would welcome an international conference on women, notably one that recognises the deeper specific values and related competencies of women, and their human rights, as the basis of a common vision and pro-active efforts towards their empowerment. “GVI would also be supportive of an event that seeks more sustainable and systemic approaches, drawing on lessons learned, best practices and communications technologies that build cooperative and accountable communities across international actors,” she said. Clarke said such a conference should also advance the application of the human rights-based approach in operational activities, including meaningful stakeholder participation and data disaggregation by gender for more equitable solutions to issues on the U.N. agenda. The president of the General Assembly and the secretary-general believe that a world conference on women could review the implementation of the Beijing Platform for Action. They also believe it could tackle emerging issues, in particular those relating to women and political participation, U.N. Security Council Resolution 1325 that deals with women and peace and security, equal access to decent work and to decision-making and the involvement of rural women and girls. The meeting could also cover aid effectiveness, food security, trafficking, drugs, migration, environment, climate change and information technology, all of which make an impact on women, and on nations and societies as a whole. “In all these matters, the role and involvement of young people, particularly women, would add an important dimension that was not properly reflected at earlier conferences.” the statement declared.